Blue Ridge Parkway Rangers completely closed the section to everyone on Friday (July 26, 2013), according to the Asheville Citizen Times. Up until then it had been open to foot traffic and cyclists since being closed on July 12. The paper reports that one crack is now about 300 feet long, several inches wide and several feet deep. The other crack is more than 100 feet long and a foot wide in places. A 21­mile section of the historic 469­mile Blue Ridge Parkway in North Carolina is closed from Milepost 376 at Ox Creek Road to Milepost 355 at Mt. Mitchell State Park. 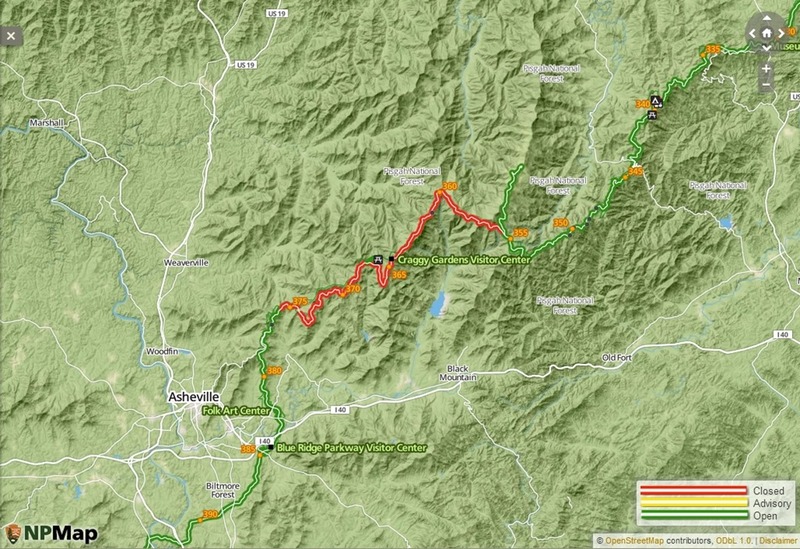 A detour route is available that directs traffic from Asheville, NC, along Interstate 40 to U.S. Route 221, back to the Parkway at Spruce Pine, NC, and alternately from Spruce Pine south to Asheville via U.S. Route 221 and Interstate 40. 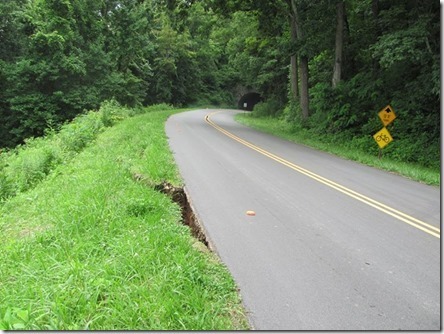 The closure is the result of significant structural damage to a section of the motor road and related shoulder areas at Milepost 374.5 caused by recent, prolonged heavy rains. Federal Highway Administration engineers have been called in to assist park managers in determining the extent of the damage and will make recommendations for necessary repairs. 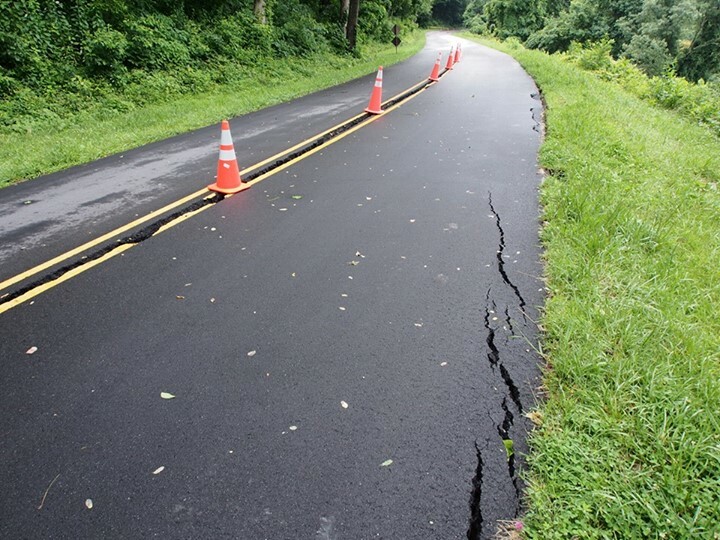 The Parkway will release additional information once a construction and repair schedule is established. The public is encouraged to use the park’s website, nps.gov/blri, to access road information and plan their visit. To ensure public safety, the affected area of Parkway is closed to all motorized traffic until further notice. Currently pedestrians and bicyclists are allowed use of the closed area; however, once construction begins, or if conditions change, the area will be closed to all visitor access. Mt. Mitchell State Park will remain open and accessible from the northern approach along the Blue Ridge Parkway from Milepost 330, at Spruce Pine, NC, or from state Route 80. The Craggy Gardens Visitor Center and Picnic Area, at Milepost 364, will remain closed for the duration of the repair project. Parkway management apologizes for any inconvenience to visitors and local communities impacted by this closure. Travelers on the Blue Ridge Parkway near Asheville will have to detour for the foreseeable future. A portion of the Blue Ridge Parkway in southwestern North Carolina is closed indefinitely after officials discovered a crack and a nearby slide in the road on Friday. 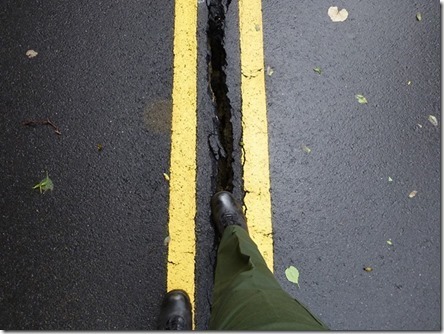 The crack is 2 to 4 inches wide and 100 foot long Parkway Chief Ranger Steve Stinnett tells the Asheville Citizen Times. The closed section runs from from Milepost 376 to Milepost 355 at Mount Mitchell State Park. The damage is believed to be from recent heavy rains in that area. What Does SPSRNK, SPSGSP, SPSMRX Mean? @RadioMediaGuy I can’t remember when part of the #Parkway wasn’t closed.